The Mystery of History (MOH) series is designed so that even inexperienced parents can break free from traditional textbooks. The four MOH courses combine read-aloud information with age-appropriate activities to create a multi-sensory curriculum for history and geography with a very strong biblical base. The first two volumes are designed to be used with children in kindergarten through eighth grade, although the reading level for Volume I is about third or fourth grade. The reading level advances about two years with each volume. Thus, the reading level for Volume IV is about ninth or tenth-grade level. However, activities and suggestions are included to adapt each volume to a much wider age span. Each volume is structured for a school year with four quarters divided into two semesters. Lessons are arranged in sets of three with the expectation that you will complete three per week. Each quarter begins with “Around the world” background and introductory information that you will want to read aloud with your children. Each week includes a pretest designed to spark interest, so you want to present these in a light-hearted fashion (à la a Trivial Pursuit game) rather than as a test. Three lessons follow, each with a similar format: read-aloud information is presented from the book then you choose an activity for each child to complete. An activity is given for each of three levels. For example, the lesson on Noah in Volume I suggests that young children play a Concentration card game. Middle grade to older students might use their Bibles to find answers to a list of questions regarding the account of the Flood. Older students might instead tackle the third option, which requires research about the supplies needed on the ark for Noah, his family, and all the animals. Review activities are always included at the end of the three lessons, sometimes including field trip suggestions. Activities include work on timelines, maps, and a review quiz. Reproducible map masters are at the back of the book along with answer keys for the geography assignments. Author Linda Hobar recommends that you have both a Bible atlas and a historical atlas as references for map work. Hobar also shares creative and inexpensive ideas for making timelines with detailed instructions for using folding sewing boards as the base for portable timelines, although any timeline will do. You can see how all of this can break out easily into three days of lessons with their activities, a fourth day for timeline, mapwork, and quiz, and a fifth day for a field trip or focus on other subjects. Other possible scheduling suggestions for different levels are at the front of the book. I appreciate Hobar’s explanation of the shift toward increasing student responsibility that should take place over the years. She has a simple diagram that shows high teacher involvement with minimal grading for young children that gradually reverses to low teacher involvement and thorough record keeping and grading at high school level. This approach to education is reflected in the activities suggested for the different levels. Younger children will spend more time working one-on-one with a parent. They have more arts-and-crafts type activities that are not graded. Older students do more independent research and writing that is graded. Volume I relies heavily on scripture since the Bible is a source for much of what we know about ancient times. Other than that, the historical information is all presented within this book as it would be in a textbook. No other reference works are required for this study except for research activities older students might pursue. However, a large list of other books and videos that expand upon subjects is in an appendix, presented lesson by lesson and broken down by age level. Beginning with creation, the study follows biblical history, incorporating other sources as they fit into the chronological story. Thus, Stonehenge, early Egypt, and the Minoans are taught before Abraham, Jacob, and Joseph. The little we know about world civilizations is represented by the inclusion of lessons such as those on Chinese dynasties, India and Hinduism, and early Greek city-states up to the point where the historical record broadens and we have more sources for learning about early civilizations. Although eastern civilizations are given some attention, the focus is much stronger on western civilizations. While this is essentially a study of history, it is also a Bible study of sorts with an apologetic flavor in spots. The appendix of Volume I includes an adaptation of Campus Crusade’s booklet used for leading people to accept Christ. A letter to students at the beginning of the book direct students to that section of the appendix if they don’t already have a relationship with God. For Volume I, there is an optional set of eight audio CDs with the stories. The second volume follows the same layout as the first volume although the biblical chronology concludes after the first few weeks of the course. There are 28 weeks worth of lessons instead of 36 as in Volume I, but each lesson has more content. You will want to have access to an atlas for this volume, and some recommended atlases are listed in the introduction. Lists of additional resources you might use are at the back of the book. Hobar’s selection and presentation of topics are fascinating. Given the huge time period she covers in Volume II, she does a great job of pulling out key people and events so students get the big picture. For Volume II, there are an optional set of 12 audio CDs with the stories and a cookbook. Volumes III and IV are formatted differently than the first two volumes. Each course is divided into a Student Reader and a Companion Guide. Student Readers are large, colorful, hardcover books, while the Companion Guides are sets of 500 to 600 black-and-white pages. Printed pages of the Volume III Guide come three-hole punched for insertion into your own binder, but you can also buy the Volume III Guide either on a CD-ROM or as a downloadable file. The Volume IV Companion Guide is only available as a downloadable file. The Volume III and Volume IV Student Readers have more text than Volume II and significantly more than Volume I. Author Linda Hobar says the target audience for Volume III is primarily grades four and up, but Volume III seems to me best for junior high and high school level simply because of the breadth and depth of information covered. Volume IV was written for grades seven through twelve but seems especially good for high school. Hobar suggests that "younger" (grades one through five) and "middle" students (grades six through eight) might listen in on parts of lessons in Volumes III and IV and participate in age-appropriate activities suggested in the Companion Guides—there are plenty of activities for all ages! Recommendations for appropriate books to read are also in the Companion Guides. The quantity of material, as well as the depth of the content, might still be too much for even some fifth and sixth graders. Volume IV's coverage of wars and philosophy makes it inappropriate to include younger students for many lessons. Keep in mind that the writing style is very engaging, and this certainly helps to offset difficulty in the level or amount of content. Occasionally, the author suggests that “younger” or “middle” students stop reading at a certain point and that older students continue with material that is deeper or more detailed. Lessons with particularly sensitive content include a note to the teacher at the beginning of the lesson or segment so you won’t be caught off guard. This helps, but ultimately parents have to decide how much of the material to cover with children in lower grades. Even given the amount of material in the readers, Hobar says that high school students should be reading additional books and primary source material from the extensive “Supplemental Books and Resources” sections in the appendices of the guides for Volumes III and IV. Hobar says that the combination of reading and activities for Volume III’s “core curriculum” should take about one to three hours per week to complete, and Volume IV should take a bit more time. For a high school credit, students should generally be spending four to five hours per week. To fulfill the hours requirement, students might also tackle a research paper or a number of shorter reports. Assignments already in the Guides might easily be expanded into lengthier assignments, and some suggestions for this are provided in the Guides. 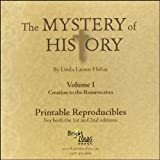 While high school students might complete both of the first two volumes of Mystery of History in one year, Volumes III and IV each provide enough material and suggested activities for year-long high school courses. Keep in mind that high school students will need to complete a separate U.S. history course. If you need to condense MOH courses, you might skip some chapters, especially chapters in Volume IV that duplicate material in your U.S. history course. Volume III covers the time period of the Reformation. Although Hobar does a better than average job of trying to present the Catholic side of issues (e.g., indulgences), the content is strongly Protestant. Volume IV teaches modern history under four "war" themes: Wars of Independence, Wars of Ideologies, Wars of the World, and Wars of Modern Times and the Hope of Mankind. In spite of these organizing themes, the course covers many other topics regarding culture and religion. Selected historical figures are highlighted such as Voltaire, Benjamin Franklin, Hudson, Taylor, Helen Keller, Martin Luther King Jr., Mother Teresa, Billy Graham, and Nelson Mandela. Volumes III and IV have the same supplemental components as the first two volumes except for the Craft Pak. This combination of self-contained history and multi-sensory activities should be very appealing to many homeschooling families. You might want to check out the ready-made lesson plans from Homeschool Planet that are available for Mystery of History.